Last year, Elise Portale from Atomic Ranch reached out to me about our exterior refresh. 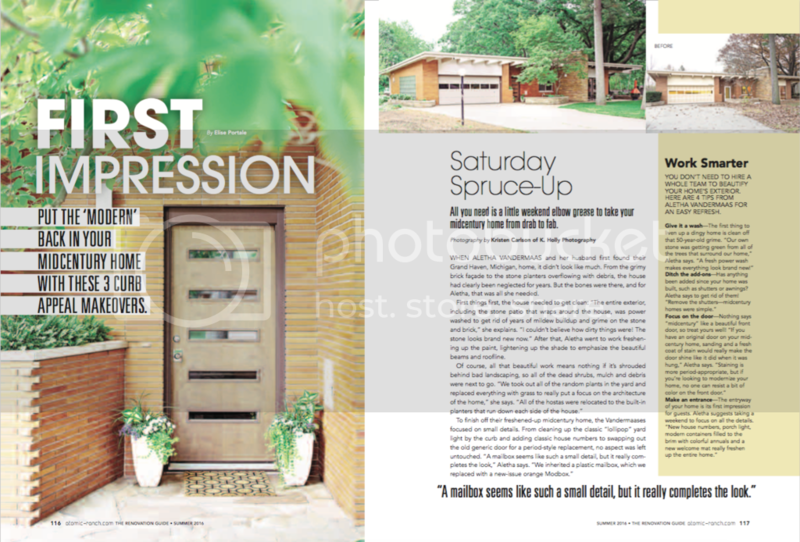 While our home was in the Summer 2015 edition, she specifically was looking for quick tips on how to do a Saturday Spruce Up and I happily helped with some ideas. Thankfully, we didn't need to make any HUGE changes to the exterior of our home, but we did shine things up a bit. It's amazing what some house numbers, porch light, full planters, and a graphic welcome mat will do to a place! Of course, the new front door doesn't hurt, but sadly Crestview Doors is no longer in business.